Meghan Hawkes has a new book on tales of Thames from the local newspapers. 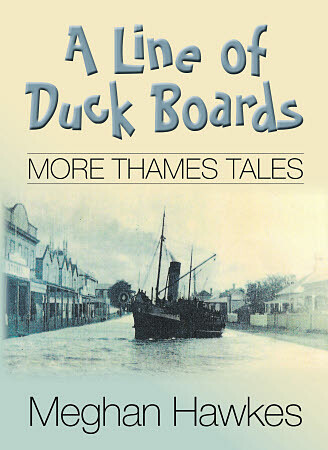 Called "A Line of Duck Boards" it is available from The Treasury at Thames; as well as the first book called "The Coming Year." For those coming to the upcoming Heritage Festival, there is a dramatisation of excerpts from the book - 19th and 20th March 2013. The Coromandel Heritage Trust has taken another step forward and nearer the building of the new archives building. 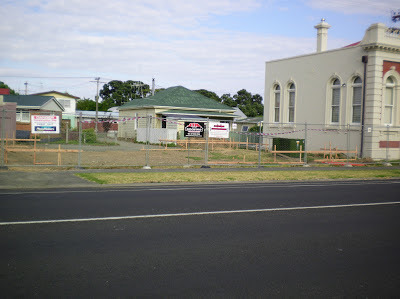 The site is now cleared and ready for the building work! Keep an eye on the HERITAGE FESTIVAL Programme - there are many new items. 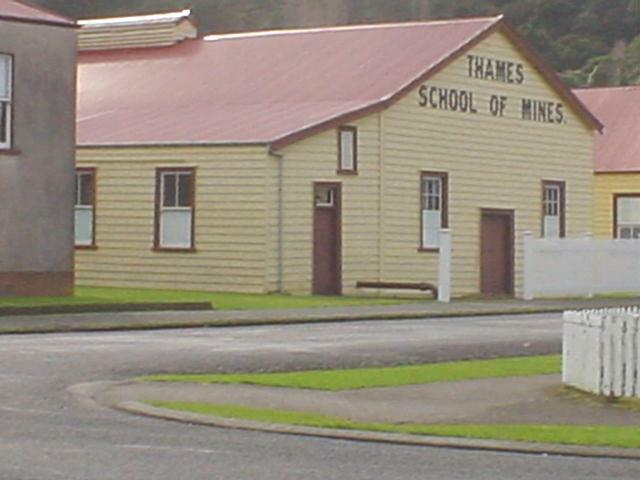 There will also be evening presentations on gold field technology, Maori mining on the Thames gold field, and one from the Chief Executive of NZ Historic Places Trust, Bruce Chapman CE NZHPT on "Heritage Matters". 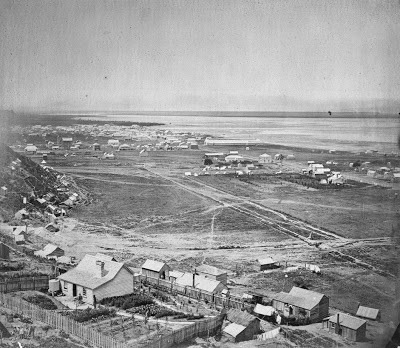 Historian David Wilton will speak about the Big Pump which was installed on the flat near Moanataiari in 1872. 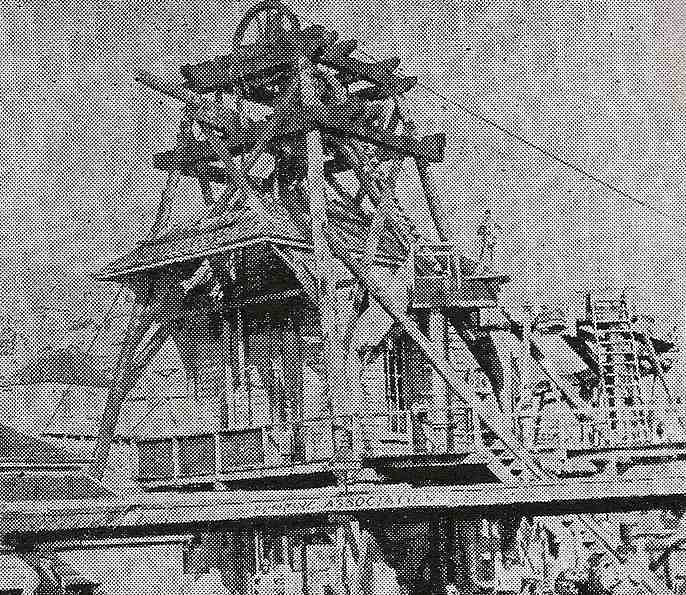 This followed the record production of the Caledonian Mine in 1871 and optimism was high that optputs would be as great at deeper levels. At the time, the pump was reputed to be the largest steam pump in Australasia. 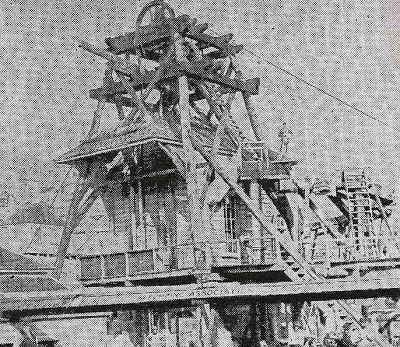 It provided services to mines on the flat until it was superceded by an even bigger pump - at Bella St - around 1895. Nearly forgotten for over 100 years, the Big Pump was to make itself known to Thames-ites in 2012, when its shaft collapsed under the main road north of town. This led to an intensive investigation and archaeological analysis of the site, which will be described in the talk. Local archaeologist Brenda Sewell will speak about early settlers from Polynesia who landed on the eastern coast of the Coromandel Peninsula, what they found and how they adapted to a much cooler climate. Excavations at Sarah’s Gully and Opito illustrated the changes that took place through various cultural layers covering about 400 years of prehistory. One of the fascinations of the many forensic TV programmes is the piecing together of many different bits of evidence to find out whodunit. Although archaeology doesn’t investigate crime scenes the methods are very similar. Renowned archaeologist Dr Caroline Phillips will explain what the archaeological evidence reveals about Shortland. 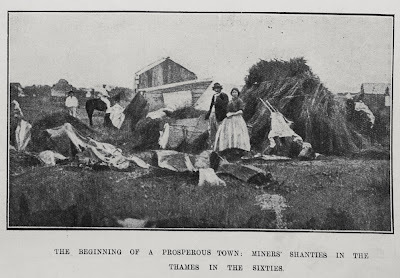 This presentation by Waihi historian Sue Baker Wilson provides a short summary of the formation of the New Zealand Engineers Tunnelling Company (NZETC) and their service on the Western Front. It is also an account of a journey of rediscovery and recognition. In 2012, the first WW1 unit specific overseas pilgrimage was made by Tunnelling Company descendants and supporters. Sue has a long term interest in military history and has constructed what is regarded as New Zealand’s first World War One e-memorial. During the Heritage festival this year, the Thames Library are holding an event called: Capturing the Present, to become the Heritage of the Future. 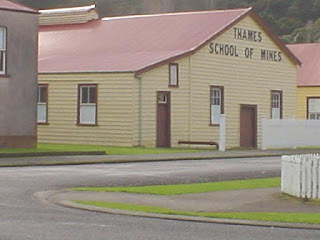 Add your photos and memories to a digital archive collection of buildings and homes in Thames. Bring in your current (and old) photos of buildings around Thames - perhaps your home, your workplace, your school. We'll help you scan and upload them to the Thames Streets & Places basket on Kete Hauraki Coromandel. Material in this Kete is harvested to National Library NZ's National Digital Heritage Archive, ensuring that it will always be safely stored for future generations to access. Play your part in leaving a trail for future generations to explore. Staff and volunteers will be on hand to help you each weekday during the Festival, from 10am to 12 noon, at Thames Library. 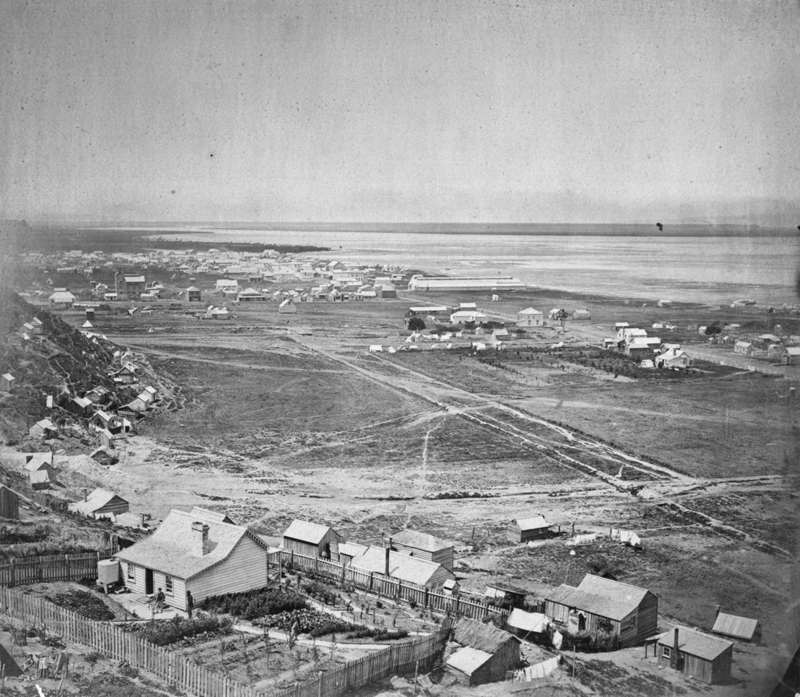 Looking south from Irishtown, over Shortland (Thames). At centre right of image (amongst small group of buildings on the flat), are the premises of Butement Brothers, Manufacturers of Aerated Waters and Cordials, situated along Pollen Street. The Butement Brothers had aerated water factories established in Dunedin, Greymouth, Christchurch, Wellington and Shortland. The long white building in the centre background is Smale's Folly (Smale's Boarding House), built 1868/9. Phoenix Brewery?, centre left. Old cars, fashion parade, and many musical and film related items. Or fancy attending a Victorian Dinner at Rev Lush's old house? Label: THE BEGINNING OF A PROSPEROUS TOWN: MINERS' SHANTIES IN THE THAMES IN THE SIXTIES.